The New York City Charter Revision Commission has issued its schedule of public hearings for April, 2010. One hearing is scheduled in each borough. The first hearing will be held on Tuesday, April 6, at the CUNY Graduate Center, 365 Fifth Avenue, in the Proshansky Auditorium. This hearing, like all the others except for a 4 p.m. hearing in Brooklyn on April 20th, is scheduled to start at 6 p.m. The full public hearing calendar can be found here. 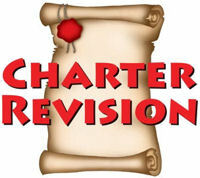 This entry was posted in 2010 NYC Charter Revision and tagged 2010 charter revision, 2010 NY charter, bloomberg charter, charter revision, New York City Charter, New York City government, NY charter commission, NY charter revision, NYC charter. Bookmark the permalink.